“Angels on Horseback” are oysters wrapped in bacon and broiled. 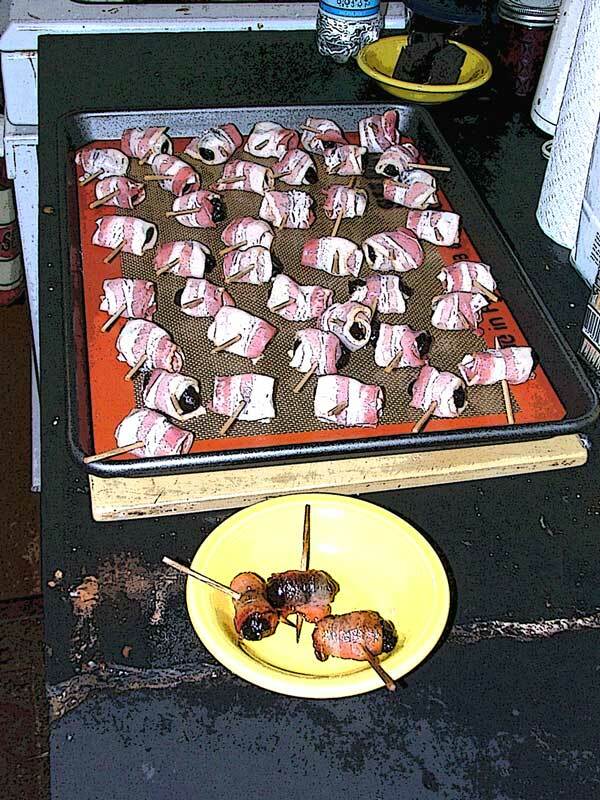 It only seems natural that someone who loved that concept, but not oysters, would create “Devils on Horseback” which have prunes standing in for the mollusks. These are absolutely delicious. Purchase “sandwich picks” to make these beauties. They are heftier than toothpicks and stand up to prolonged baking, although they may brown a little bit. Soak them in a cup of water for at least two hours before using. Take a pound of thin sliced center cut bacon and cut the strips in half – I find that a pair of very sharp kitchen shears works best. Wrap each prune in one half strip and pin together with a pick. This is one time when regular, grocery store prunes will work better than the sundried natural variety because they’re softer and more malleable. Lay them out on a cookie sheet covered with oiled foil or your trusty Silpat and bake at 375 for about 20 minutes, turning once. The bacon should be cooked through and the prunes soft. Devils are VERY hot right out of the oven – don’t just pop one in your mouth. These are good appetizers if you have to travel. Scooped off the cookie sheet hot from the oven and transferred to a heavy serving bowl and covered with foil, they’ll stay hot for quite a distance. Then maybe, someday, you’ll be inspired to try the Angels. This entry was posted in appetizer, Holiday, recipe and tagged recipe, winter on December 26, 2010 by APo.